It’s been a gloomy, rainy, and WINDY few days here on the high desert, and my taste buds wanted comfort food. And when you’re a Texas gal like me, sometimes that translates into Tex-Mex. I had some leftover shredded carne asada beef in the freezer, and of course the obligatory package of dried ancho chiles in the pantry. (What, you don’t keep those hanging around, just in case??) So of course, enchiladas are on the menu! My Texas buddy Adam provided the inspiration for these, because Adam is connoisseur of all food Tex-Mex. No really, he is! 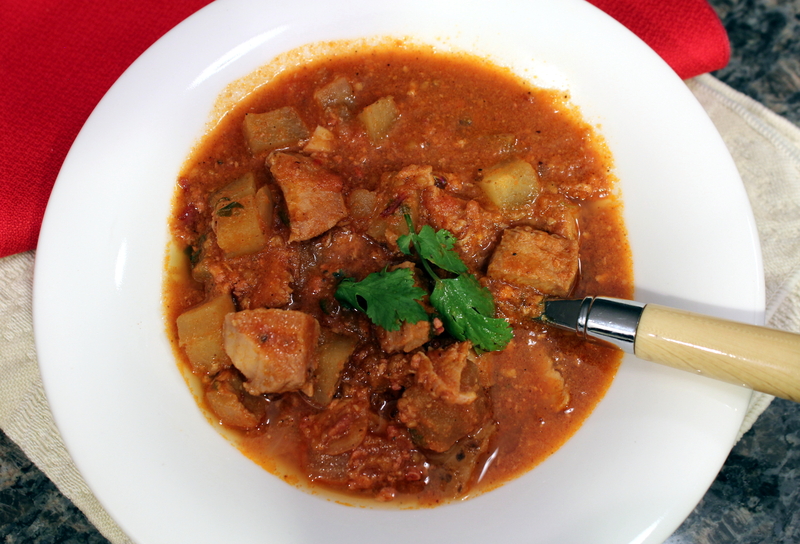 I grabbed this recipe out of his archives, because a good enchilada sauce is timeless. Do yourself a favor and read his post about it, you might be enlightened! 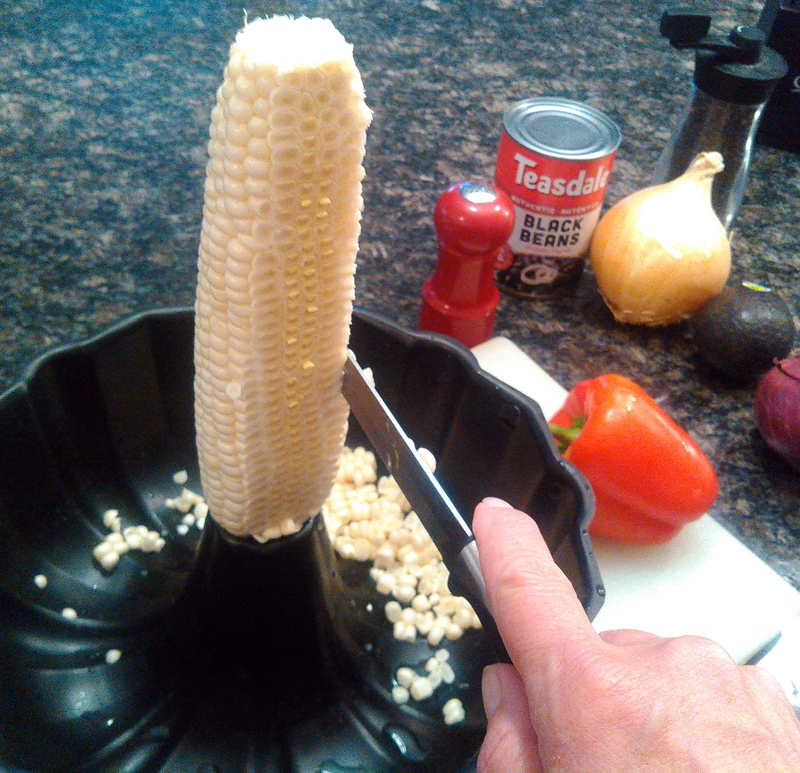 Tear the tops off the ancho chiles and remove as many seeds as possible. Place the chiles in a sauce pan of simmering chicken broth until rehydrated and soft, about 10 minutes. Meanwhile, sauté the onion in a large skillet with a tablespoon of oil until softened. Add the garlic in the last couple minutes. Remove the chiles when softened, reserving the liquid. Add them to a food processor or blender along with the cooked onions and garlic and blend to a purée. In the same skillet, stir in 2 tablespoons of oil and 2 tablespoons flour and cook until starting to turn golden brown. Pour the chile purée into the skillet, along with the reserved chile liquid. Stir in the cumin, oregano, and salt and pepper. Sometimes the ancho chiles can be bitter (haven’t figured out why yet) so add a tablespoon of honey and a bit more salt to mellow it out, if needed. Bring to a simmer and then cook on low for about 30 minutes. Add additional water if it gets too thick. When ready to assemble: Preheat oven to 400 degrees. 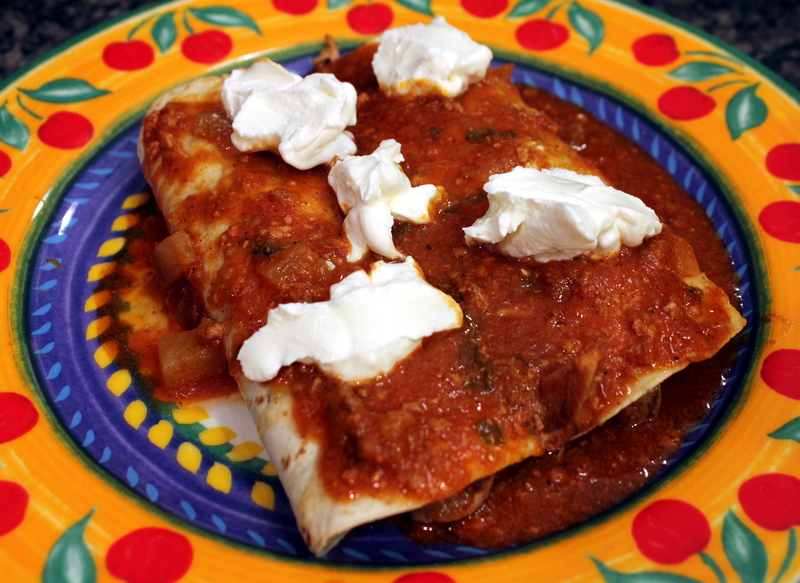 Using tongs, dip a tortilla into the enchilada sauce on both sides, then place on a plate. Top with 2 tablespoons cheese and 2 tablespoons of meat, roll up and place seam side down in a greased baking dish. Repeat until baking dish is full. 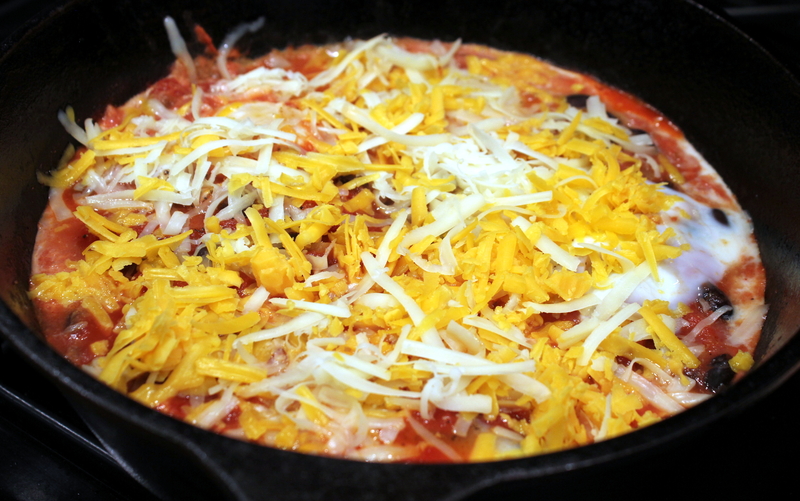 Pour the remaining sauce over the enchiladas and top with the remaining grated cheese along with the reserved onion. Heat in the oven for 10 minutes until cheese is melted and dish is bubbling. Remove and top with cilantro and offer sour cream on top, if you want. 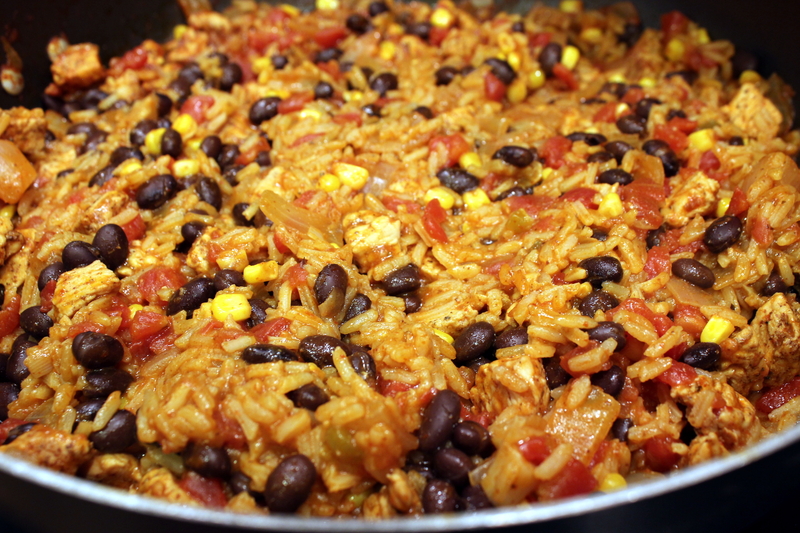 Serve with pinto beans and Mexican rice. 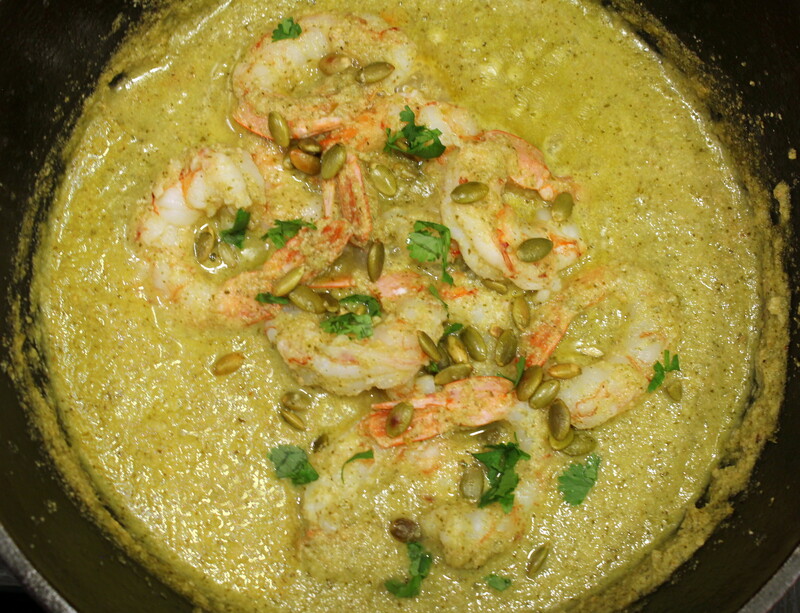 We have a nice stash of jumbo (16-20 count) shrimp in the freezer, and this tasty/tangy shrimp dish caught my eye in my blog readerboard a couple of weeks ago. It is right up my alley using Mexican-inspired ingredients, and is served over something other than a tortilla, ha! Place the pepitas, tomatillos, chile pepper, onion, garlic, cilantro, cumin, and 1/2 cup of the chicken stock in a blender or food processor. Blend until smooth, stirring and scraping down sides as necessary. Heat the oil in a skillet (cast-iron if available) over medium-high heat. Add the tomatillo mixture, which will spatter so be prepared with a screen or lid! Cook, stirring often, for about 8 to 10 minutes. Add the remaining chicken stock, bring to a simmer, and reduce heat to medium low, simmering softly and stirring often until sauce is thick and creamy, about another 10 minutes. Season to taste, with salt if necessary. Season shrimp with kosher salt and pepper, then add to the simmering sauce. Cook on each side for 3 or 4 minutes until the shrimp are just cooked through. Serve over rice garnished with pepitas and cilantro. You’d think being unemployed would have all kinds of perks, like lots of free time for cooking and blogging, right? Long story short, that is not the case, so my quest for easy and delicious dinners remains the same. 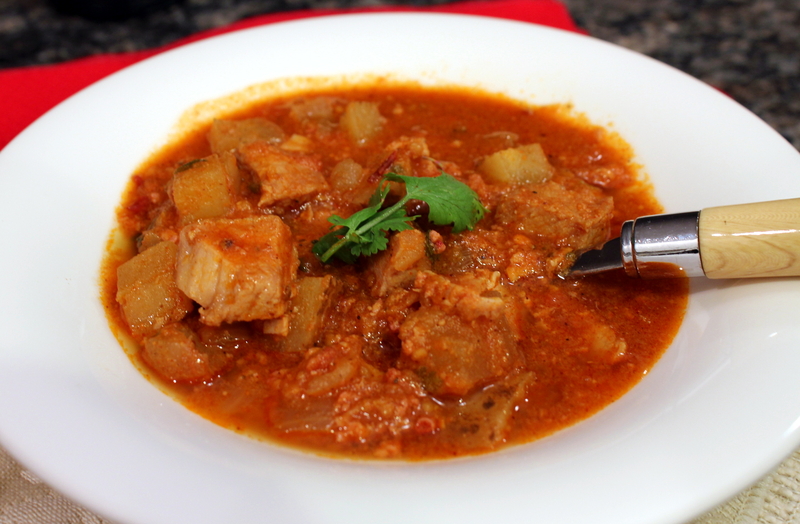 Here’s one I made a few weeks ago I had waiting in the wings (thank goodness because my spare time has been minimal) that is chock full of flavor and spice! 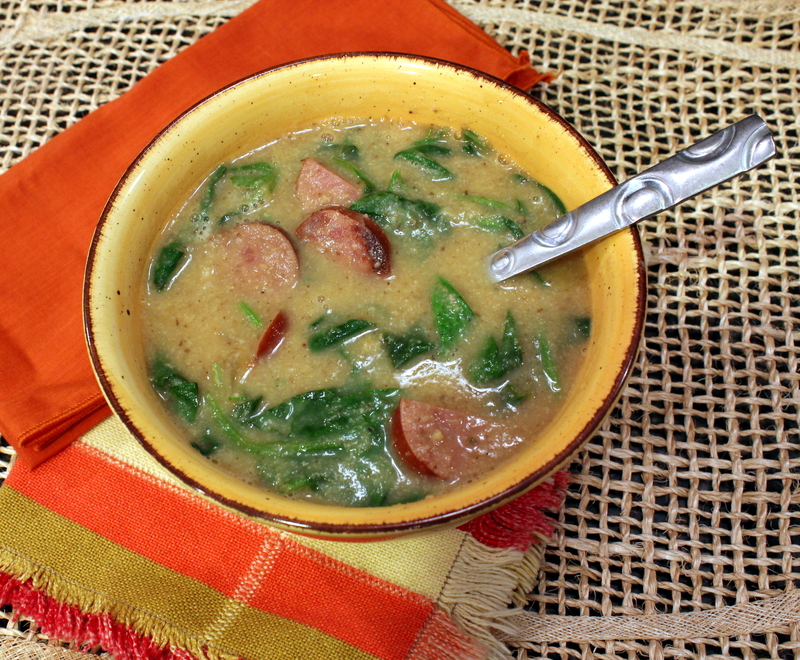 This hearty soup was one of those welcome, warming dinners on a cold and dreary evening. I hope you think so too. Drain and rinse beans (dried or canned) and set aside. 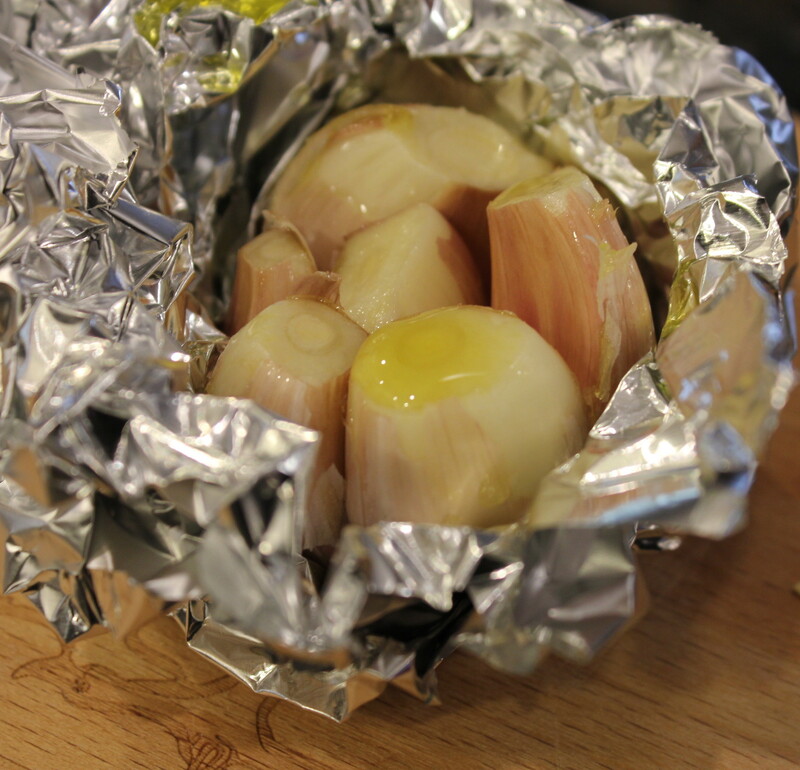 Nestle cloves of garlic cut tips up in aluminum foil and drizzle olive oil over top. 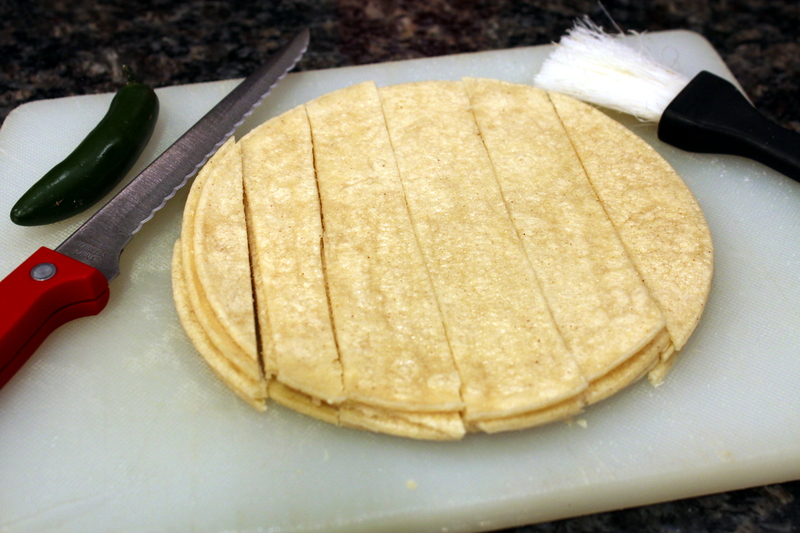 Wrap tightly and place in 350-degree toaster oven (or oven) for 25 minutes. Remove and set aside. Meanwhile, heat the tablespoon bacon grease or olive oil in a Dutch oven or soup pot over medium heat. 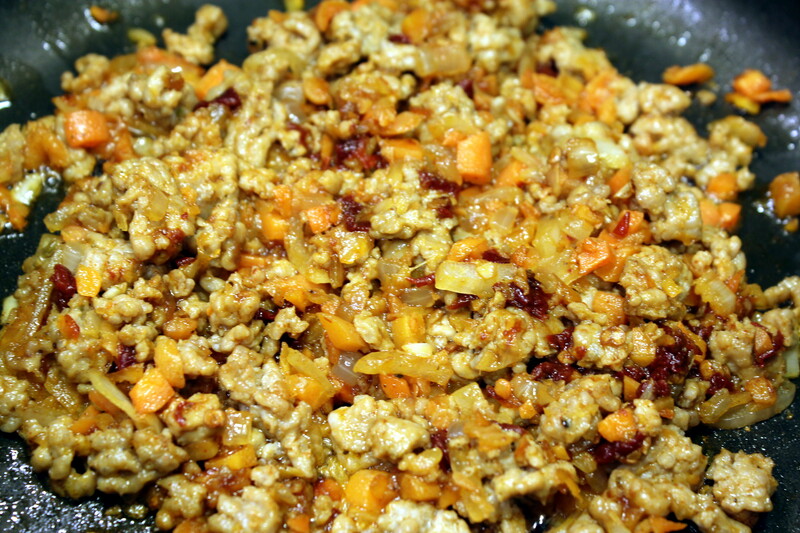 Add the onions, carrots and ground sausage, stirring until sausage is cooked through. Drain any grease, if necessary. Stir in the chipotle and sauce, smoked paprika, cumin, and cayenne pepper until combined and fragrant. Pour in the stock, then squeeze the cloves of roasted garlic out of their skins into the soup. Now add the beans. Bring up to a boil, then turn down and simmer until the beans are cooked through. For dried beans, this could take an hour or more depending on how old the beans are. Canned beans are ready when heated through. 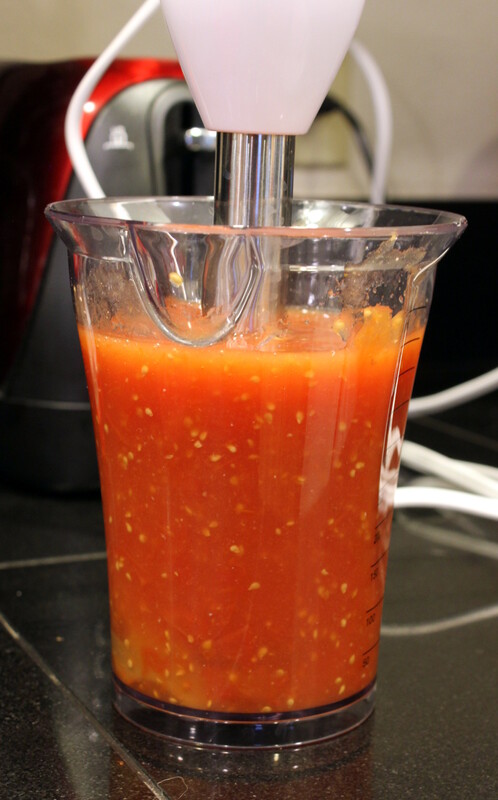 Puree the tomatoes with liquid in a container using an immersion blender stick, or a blender or food processor. (I used my new Cuisinart stick!) Once the beans are tender, pour in the tomatoes and sherry or vinegar. Taste for salt, and add if necessary. Puree about half the soup using an immersion stick, or add to blender or food processor in batches. I like mine a bit chunky. 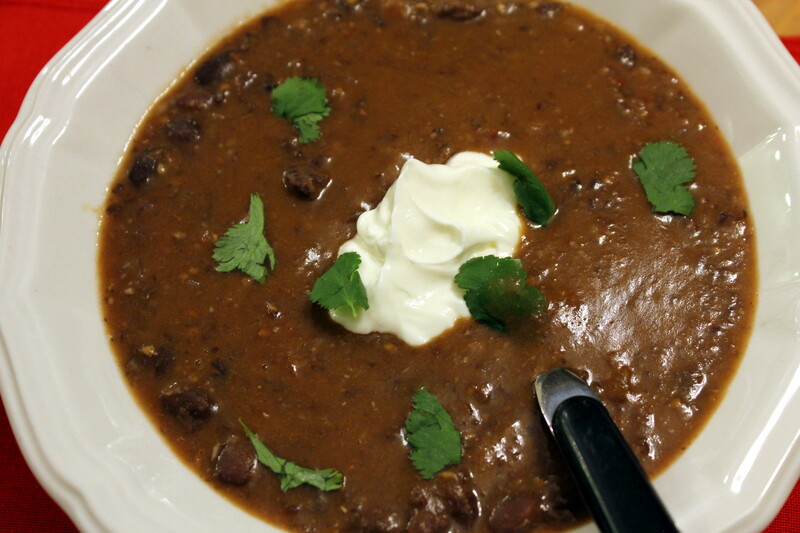 Once soup has warmed through again, serve immediately and pass with lime wedges, cilantro, and sour cream. 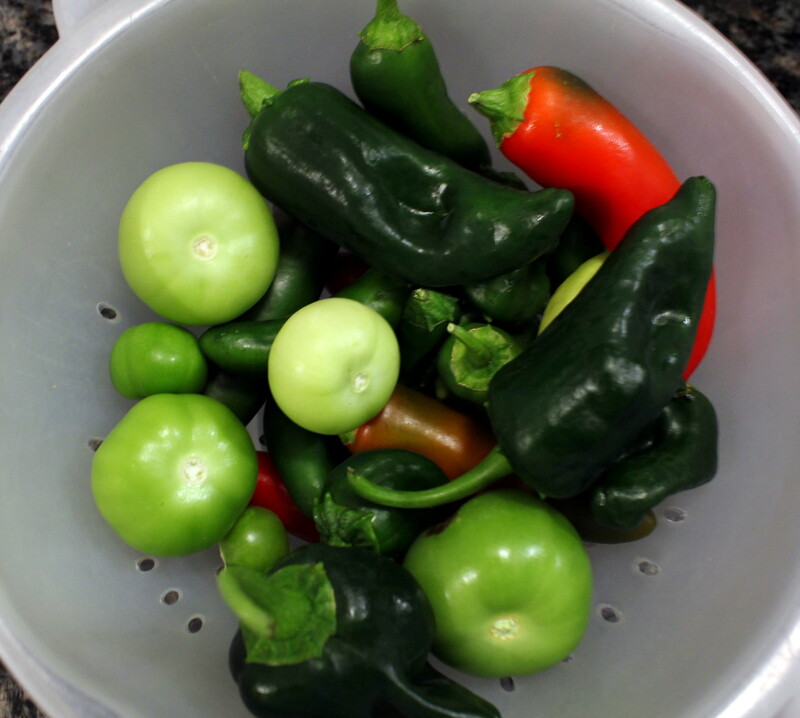 After we got back from our trip to the coast for our anniversary, I harvested the last of my chile peppers and the wee tomatillos and poblanos I managed to eke out with our short summer weather. Half the hot peppers had turned red while we were gone, but that’s OK as I like spicy! Cooking is quite the challenge one-handed, but I’ve figured out some hacks to where I don’t ask for much assistance any more in food prep. Dicing a fresh onion is the hardest I’ve found, but luckily I have a bag of diced onion in the freezer that I brought home from a work potluck, which can be used in soups and stews. Tips: A mini food processor can be used for a rough dice of carrots, celery, and onion, and a pair of kitchen shears does quick work on green onions. I do have limited use of my left thumb and forefinger, so I place the green onion between those two fingers and snip away! This soup was the culmination of wanting to use my peppers and tomatillos in something as well as a large leek that needed to be cooked stat. I roasted the poblanos, tomatillos, and a serrano until charred, then had my daughter peel and mince them for me. I then scrounged the freezer and pantry and came up with a half pound of burger, black beans, and golden hominy. 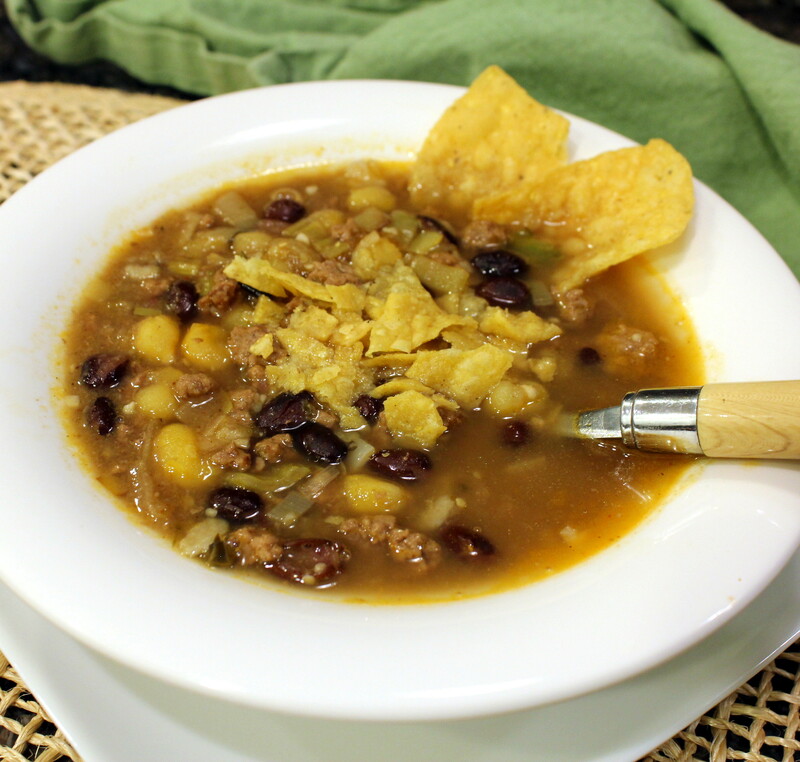 Combined with my homemade beef stock, a filling Mexican-style soup was on the horizon! I’m still limiting my prep photos until I have two hands again but this is a pretty straight-forward soup recipe. Note: I used all my very small poblano peppers and tomatillos in this, but have adjusted the recipe below for standard grocery-sized produce. Roast and prep the peppers and tomatillos. In a soup pot or Dutch oven, brown the ground beef and leeks in 1 teaspoon olive oil until burger is browned and leeks have softened. Add the minced garlic in the last minute of cooking them. Add the rest of the ingredients except the garnishes and stir to combine. Bring to a simmer and cook 15-20 minutes until the tortillas have dissolved and soup thickens, stirring occasionally. Ladle into bowls and serve with desired garnishes. 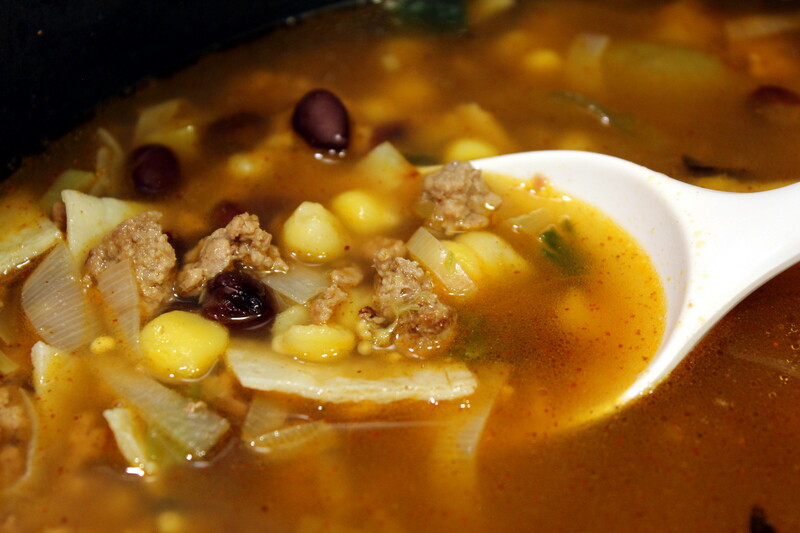 This soup was even better the next day! We’ll see you again this weekend with a new recipe! Ahhh, where oh where did the summer go? School starts this week in my neck of the woods and temperatures have gone from sizzling hot to almost frosty. But that shouldn’t stop anyone from enjoying this zesty and crunchy salad filled with summer bounty topped with a smooth avocado dressing. 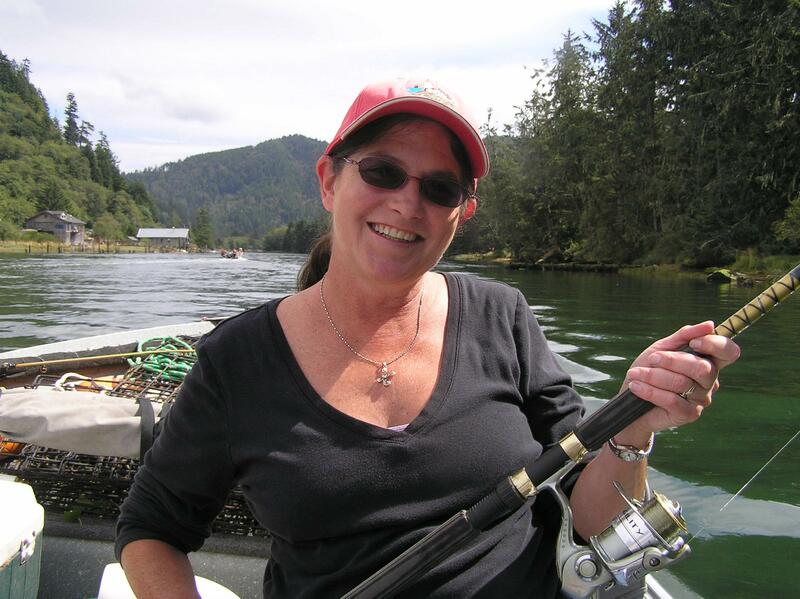 We’ve just returned this weekend from nine glorious days camping and fishing at the beautiful Oregon coast. What a wonderful way to end the summer! 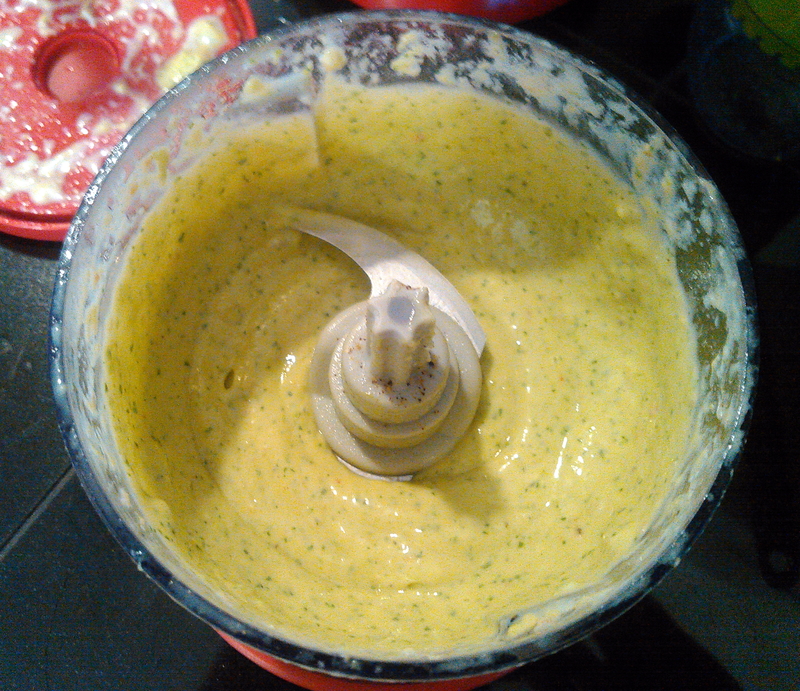 Add all of the Creamy Guacamole Dressing ingredients to a blender or food processor and blend until smooth and creamy. You will have to scrape down the sides a few times. Add additional milk, if needed, to thin to desired consistency. Chill in the refrigerator until ready to use. Next, grill the chicken breast, if it isn’t already cooked. 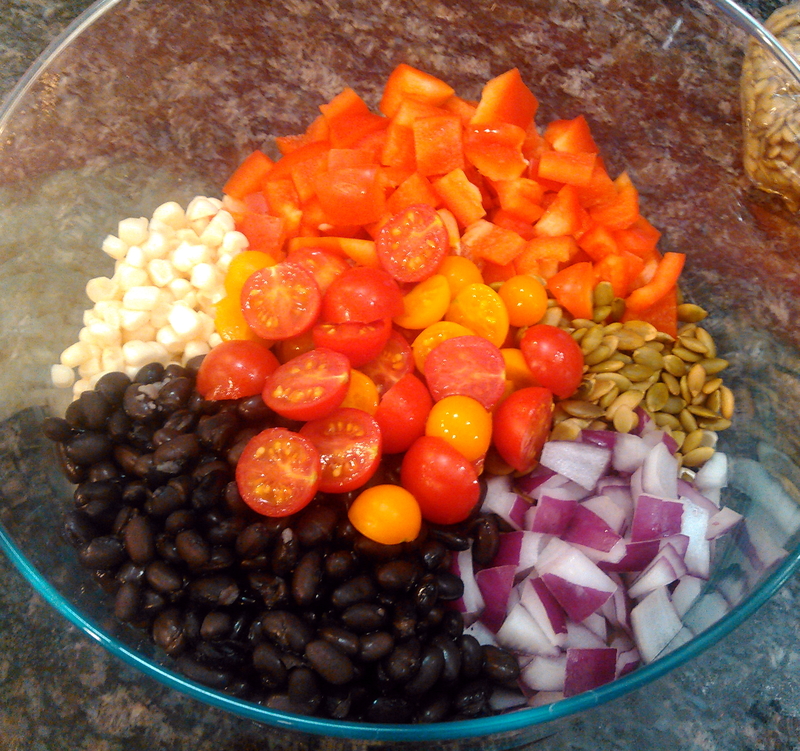 Add all the salad ingredients except dressing and chips to a large bowl. Toss to combine. 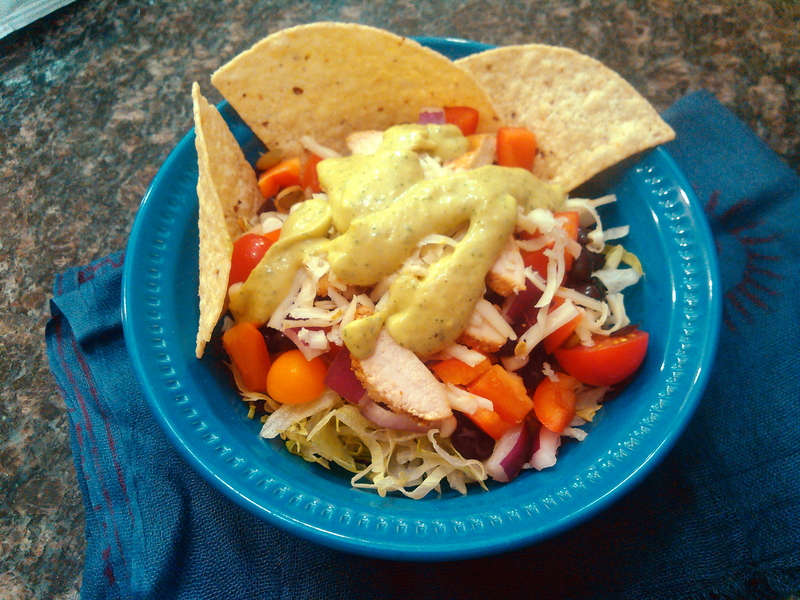 Add tossed salad to individual bowls, then top with guacamole dressing and serve with tortilla chips. I’ve been eying similar tomato sauce and egg dishes lately from the Middle East region, but “Shakshuka” uses quite a few spices that I simply don’t have. (And I have a LOT of spices!) But the ingredients and spices I almost always have on hand are Mexican in origin. 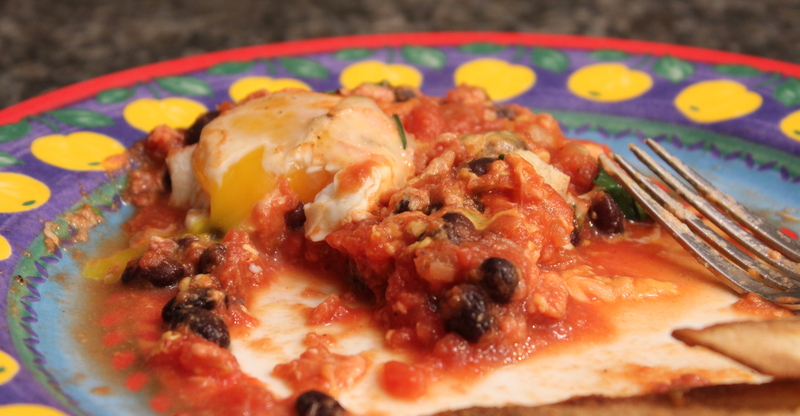 Hence, I bring to you a riff on Shakshuka, Tex-Mex style! My husband and I were disappointed I only cooked four of the six eggs. We both had large lunches, and decided one egg each would suffice. Oh boy, were we wrong! While are daughter munched happily on her second egg, we longed in silence. However, there was plenty of sauce leftover to make a repeat for lunch the next day! Preheat oven to 450 degrees. 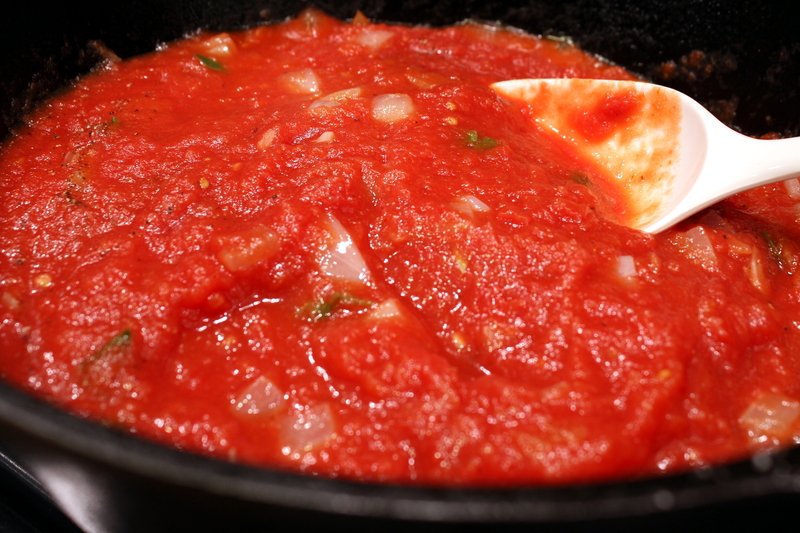 To make the sauce, add a tablespoon of oil to a cast iron or oven-proof skillet over medium heat. 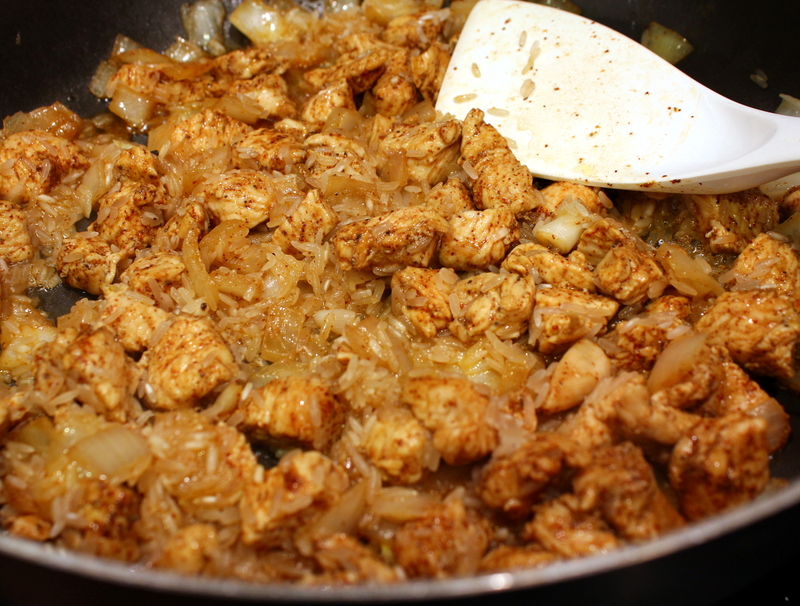 Add the spicy pepper, onion, and garlic, and cook for about 7 minutes until onions are softened. Pour in the can of tomatoes, then bring to a simmer. Lower the heat and simmer for 10 minutes. Stir in the black beans, and salt and pepper, to taste. When the sauce has thickened, remove from the heat. 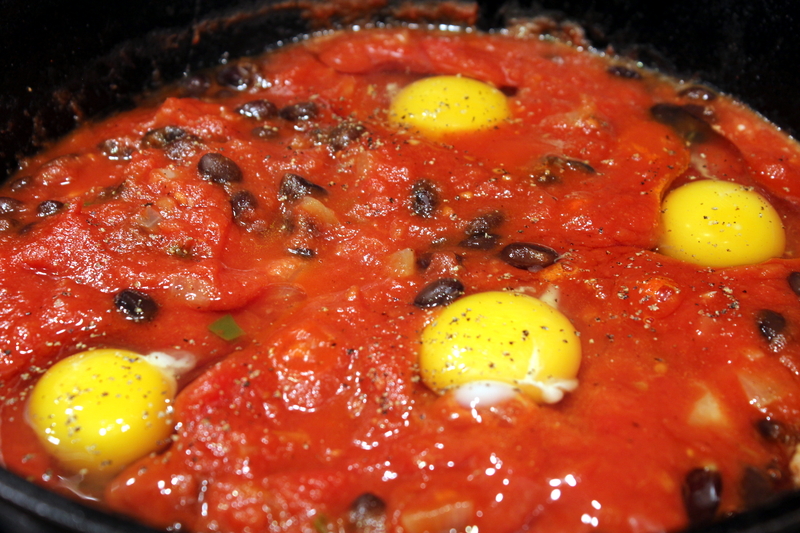 Make indentations in the sauce with the back of a large spoon, and crack each egg into the wells. Return the pan to the heat and cover. Simmer gently for about 15 minutes, until the whites are partially set. Turn the oven to broil. Sprinkle the grated cheese over the dish, then place the skillet under the broiler. Cook until the cheese is melted and bubbling and the eggs are cooked to your liking. This shouldn’t be more than a few minutes, unless you like hard-cooked eggs. Remove the skillet (carefully!) from the oven. 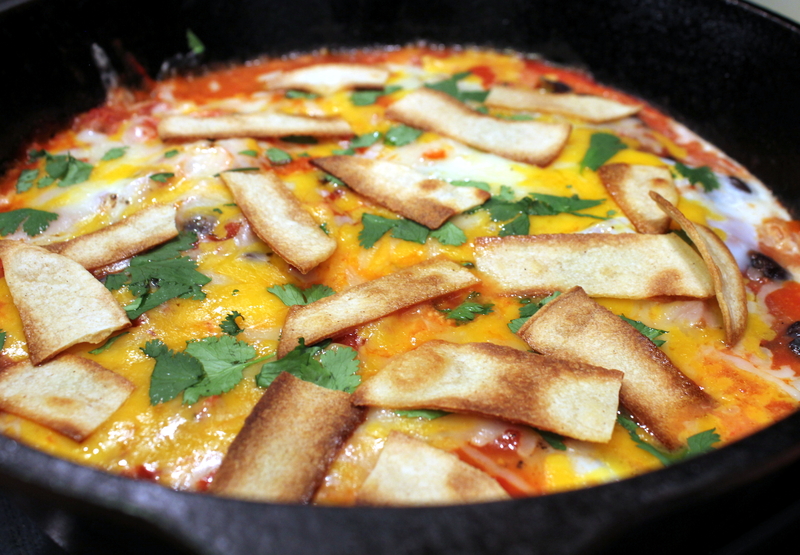 Garnish with the tortilla strips and cilantro, scoop out your eggs and sauce, and serve with sour cream if you want. I’ve been keen on making one-pot meals these days. I had a hankering for enchiladas, but I sure mess up a lot of dishes in that process. I’ve done the enchilada casserole before, which does use a few less dishes, but that is still too many when you just want to throw everything into ONE dish and cook it. Yes, a slow cooker works like that, but it was 6 pm and no time for that. A few interwebz searches yielded the brainchild for the following recipe. 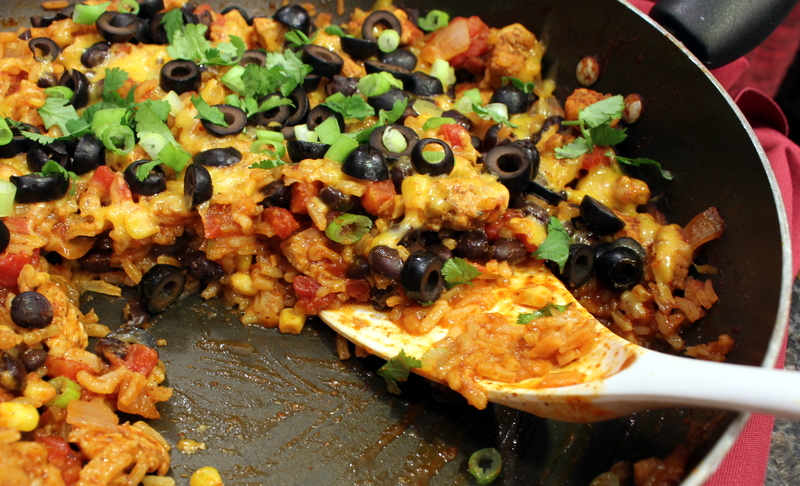 I’ve decided to call it Chicken Enchilada Skillet, because that is exactly what it is. And you could make it with ground burger, steak, or pork too! 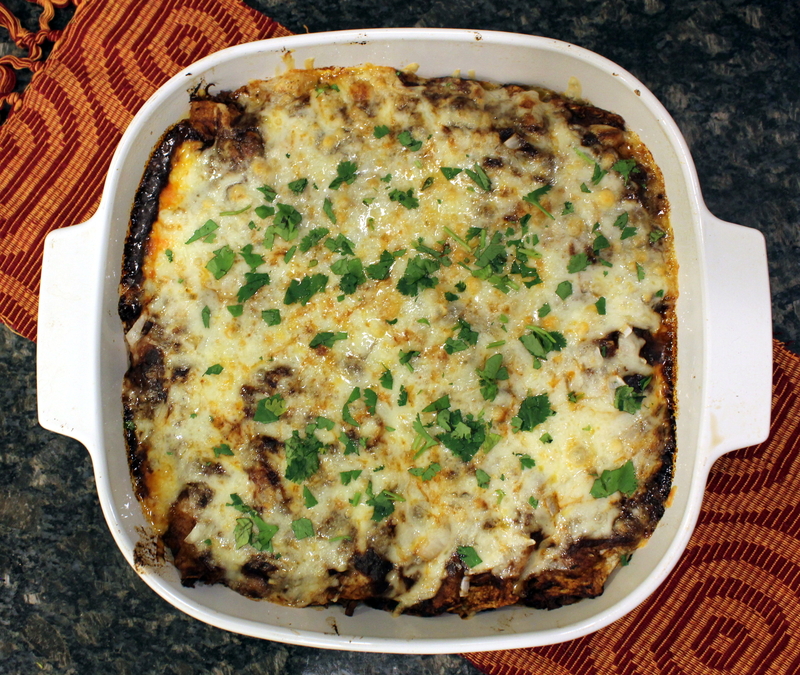 A cheesy, filling dish that tastes like enchiladas, but made in only a skillet! Win-win. 1 15-ounce can black beans, drained and rinsed. 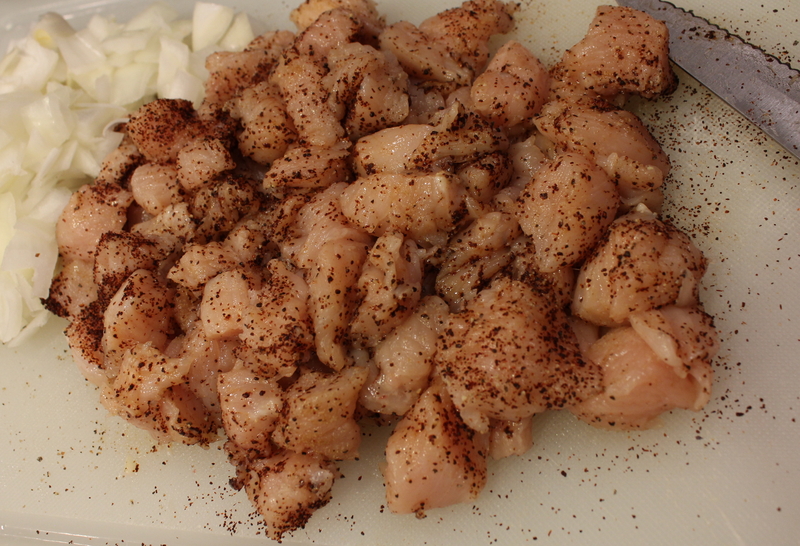 Chop the chicken into bite-size pieces, then season with the pepper, cumin, and chile powder. 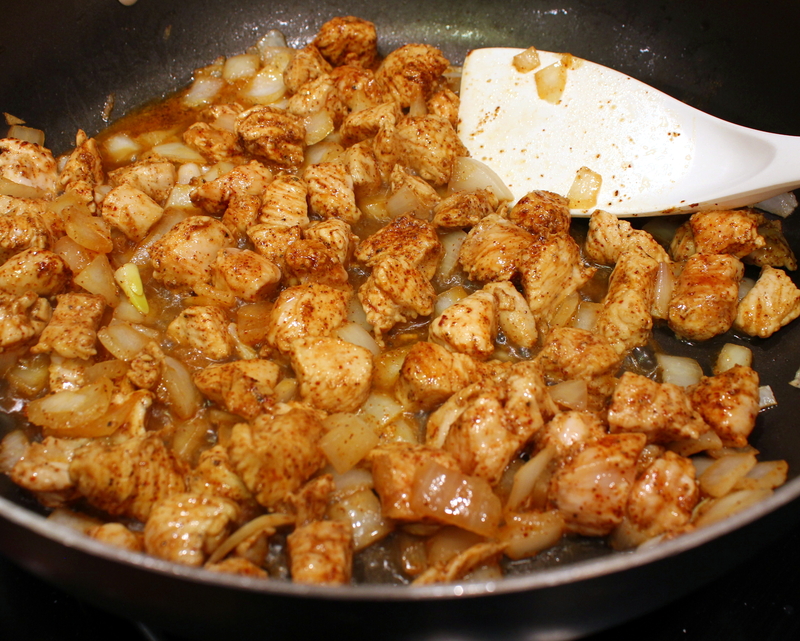 Add the oil to a large oven-proof skillet over medium-high heat, and cook the chicken and onion until browned, about 7 minutes, stirring occasionally. Add the rice to the skillet and cook about 3 to 4 more minutes, stirring occasionally. 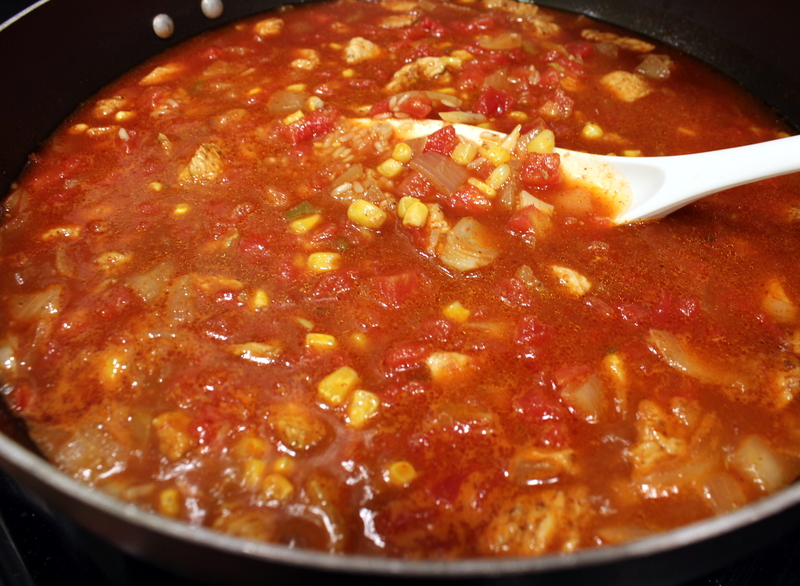 Next add the chicken broth, canned tomatoes with green chiles, enchilada sauce, and corn. Heat up to a low boil, then turn down to a simmer. Cover the skillet and cook for 20 to 25 minutes, until the rice is cooked through and absorbed most of the liquid. Remove from the heat, then add the black beans. Top with the grated cheese and black olives. Put under a broiler for a few minutes until the cheese is melted. 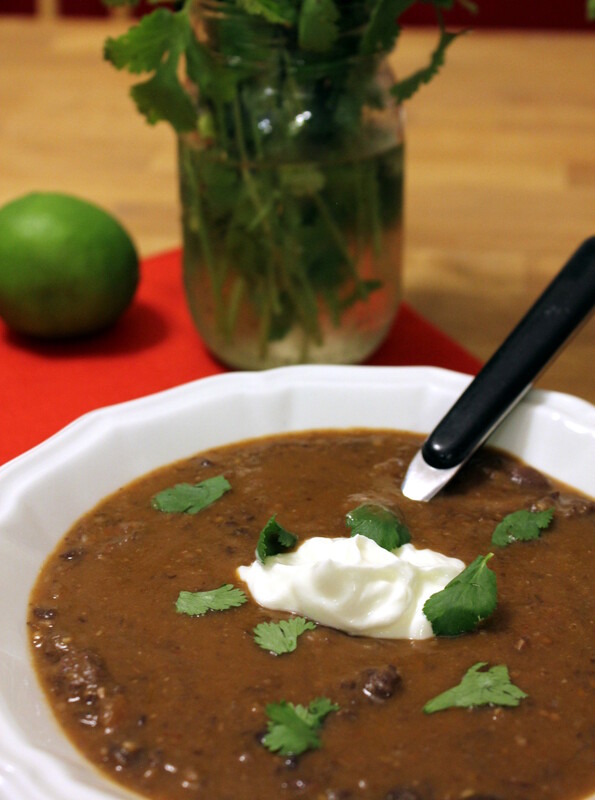 Garnish with the green onions and cilantro, and serve with sour cream and tortillas. 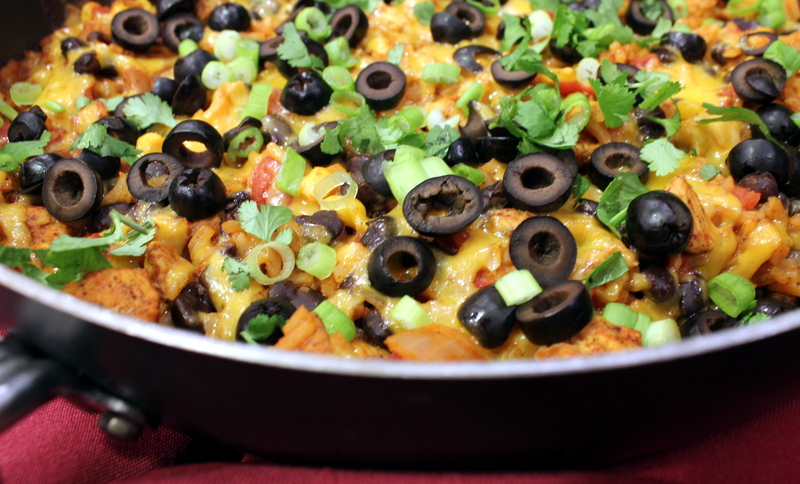 You can add the mixture to a tortilla and roll into a burrito, or just use it to dip into the enchilada skillet surprise! I don’t have any prep photos of this recipe, because I was almost certain we would be ordering pizza after we tasted this. I couldn’t be MORE WRONG! It was simply amazing!! I was so astounded that I did snap a shot of my bowl of it (sans the flour tortilla for dipping, because I was still so non-plussed how great this tasted.) Then for grins I took a shot of my hubby’s interpretation of how this should be eaten. 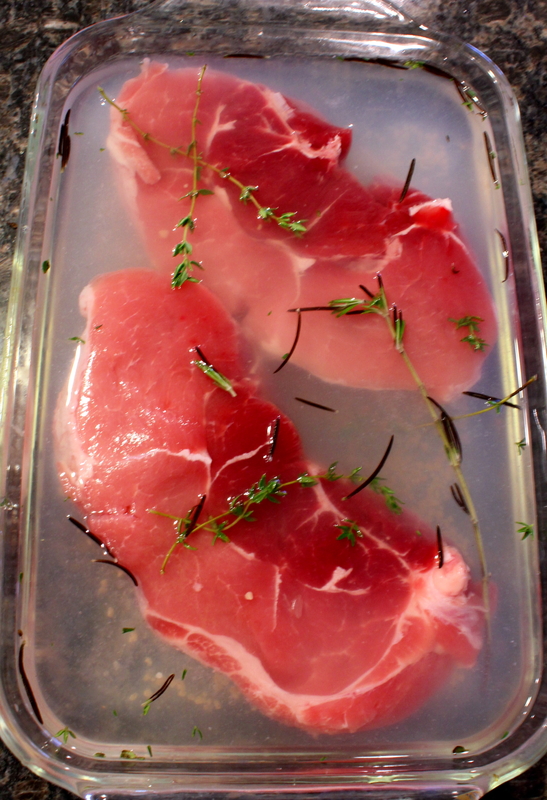 Here I am brining pork, all fanchy schmancy. Little did I know…. I threw caution to the wind, and stuck the frozen chorizo, peeled frozen tomatoes, and almost a pound of the failed pork (cut up) into the crock pot, thinking if I just cook the hell out of something it might be decent. In went some chicken broth, potatoes, onions, spices and such. Just whatever sounded good. Then covered it up and cooked it all day long, hoping it wouldn’t be a last-minute pizza night. I almost feel like I painted a masterpiece with this. Almost. This was INCREDIBLY delicious! My daughter and I couldn’t stop warming up more tortillas to slop up every last morsel of goodness. We also stirred in some cheddar cheese into the bowls, for garnish. My husband, on the other hand, made rolled up cheese quesadillas/burrito type things, stuck some of the mixture inside, and then slathered them over with more stew and mounds of sour cream. Mounds, I tell you. A little odd, but I let him do it. It’s his mouth. Rolled Quesadillas with Chorizo Stew ~ or something like that. I really don’t know what to call this. Hints: Whenever a recipe calls for a small amount of tomato paste or chipotle chiles, I freeze the rest (labeled) for later use. Just nuke for a tad and take what you need and refreeze. Yes, I got mine out of the freezer for this. Now on to the (sort of) recipe! Prep your pork and veggies and such, throw them all in a crock pot, give it a good stir to mix, and cook on low about 8 to 10 hours or high on 4 to 6 hours. Give it another good stir at the end. That’s it! Serve with garnishes. Easy, huh? I think I’ve said the adage “Do as I Say and Not as I Do” many times here. Please listen to this advice. 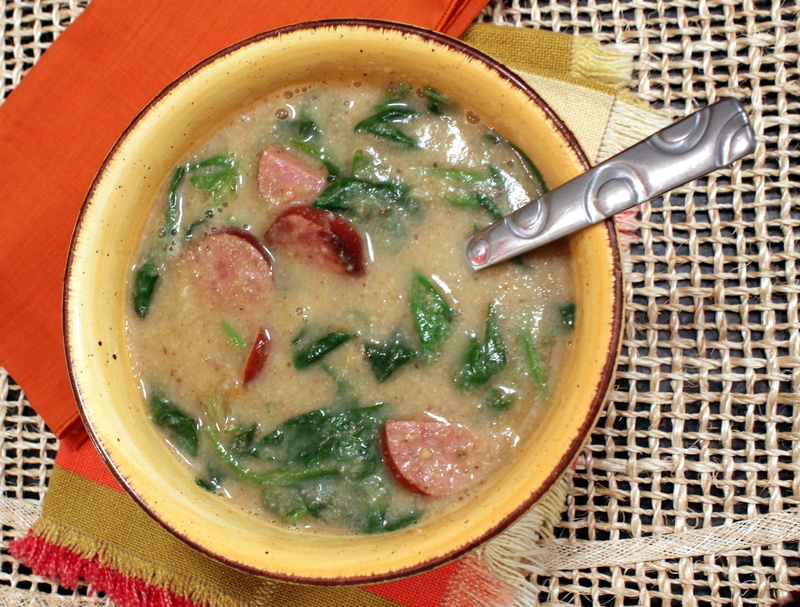 Not once, but TWICE I added the sliced sausage to the mix before blending the soup. I’m a bit daft that way, sometimes. So take my advice, and DO NOT ADD THE SAUSAGE to the soup until after you’ve blended it, OK? Otherwise you have to keep fishing it out of everything and placing it in a bowl. Good, we got that out of the way now. Preheat oven to 450 degrees. 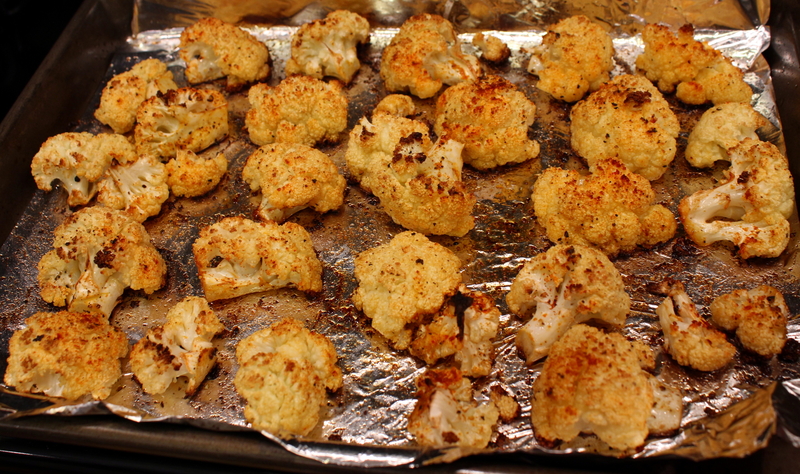 Toss the cauliflower florets with cumin, smoked paprika, salt and pepper, and some good splashes of olive oil. Spread in a single layer in a roasting pan and roast in the oven for 30 minutes, flipping at the halfway mark. Remove from oven and set aside. 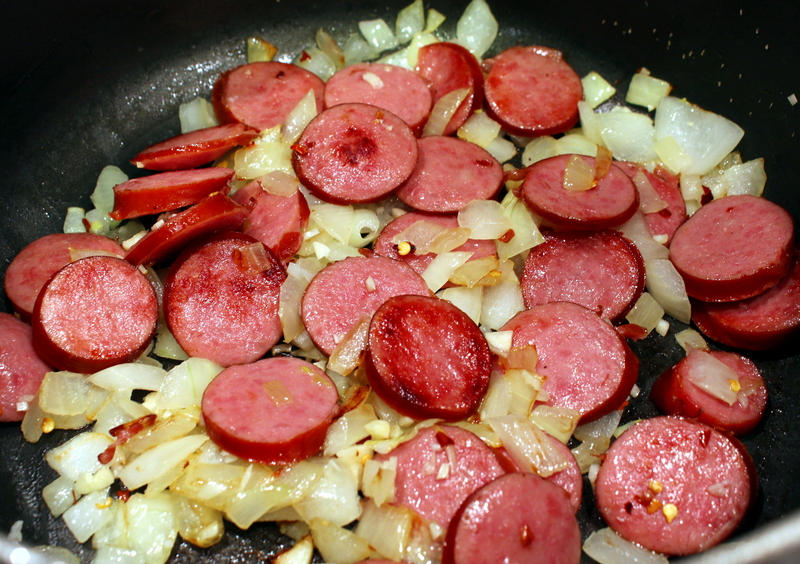 In a soup pot or Dutch over medium-high heat, saute the onion and Kielbasa in 1 tablespoon of olive oil until onions are tender and sausage is browned, about 10 minutes. Add the garlic and red pepper flakes and stir for about a minute more. Remove the mixture to a bowl. Now. Do not forget this step. Return the blended soup to the pot over low heat. 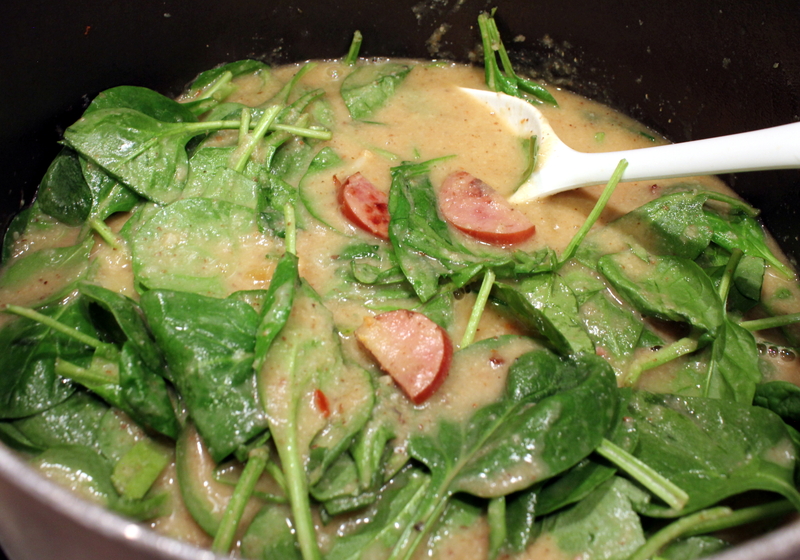 Add the sausage and onion mixture, the spinach, and the parsley and heat for about another 10 minutes until the spinach is wilted and soft. Remove from heat and stir in the chopped cilantro and lemon juice. Ladle into bowls and serve with thick slices of crusty, buttered bread. Welcome to my mouth, you complex creamy soup!